Logic Pro is a powerful digital audio workstation (or DAW) which allows you to record and edit both MIDI and audio to a professional standard. Whatever style of music you wish to create, Logic has the tools for the job. Included with Logic Studio is a range of instruments and effects including a drum machine (Ultrabeat), a powerful sampler (EXS24) and an impressive range of synthesizers. You will also find emulations of classic instruments such as the Hammond B3 and Fender Rhodes pianos. To complete your track you can call upon a wide range of audio effects including reverbs, delays, distortion effects, compressors and much more. 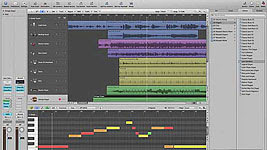 All in all, Logic Pro represents a complete music production package for your Mac. Well as you can see, Logic is a pretty comprehensive package, but to get the most from it you are most likely going to need a couple of additional pieces of kit. Firstly a sound card or audio interface. Most computers come with a built-in sound card to listen to your mp3s, watch DVDs, play video games, etc... This sound card, if equipped with audio inputs & outputs, can also be used (if compatible) with your software. However, if you plan to do a lot of recording and mixing, you really should invest in a dedicated sound card. Secondly a MIDI keyboard. This will enable you to “play” all of the instruments within Logic. Again this is not an expensive purchase. But it will be invaluable in terms of creating musical ideas – even if you don’t play piano. Otherwise you will have to resort to programming in each individual note or sound step by step which is not only laborious but also creatively stifling. Remember the great thing about software like Logic is that you can go in and edit what you’ve played at any time so you don’t need to be a great keyboard player to start making music. In our next lesson we will cover midi keyboards, audio cards, latency and buffer size. In the meantime there's plenty more useful information to be had in our our free lesson excerpts in Point Blank's logic courses.